Is high-flow nasal cannula therapy feasible for managing bronchiolitis in children in the emergency department? Bronchiolitis is a common condition affecting infants. 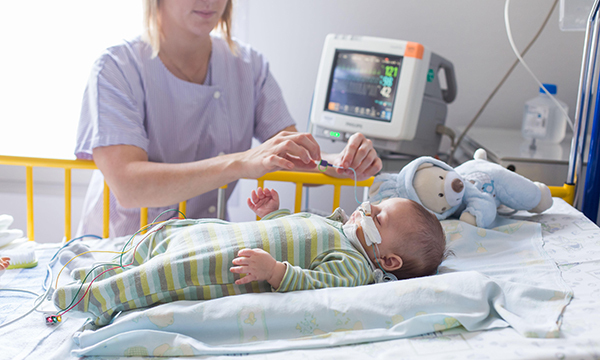 Emergency department (ED) management of the condition for children in England has involved oxygen therapy through use of a standard oxygen mask, which children do not always tolerate. Recent research has looked at high-flow nasal cannula therapy as an alternative way to manage bronchiolitis in the ED. To determine whether high-flow nasal cannula therapy is a suitable and effective approach in EDs for infants with bronchiolitis. Databases that were searched included CINAHL, MEDLINE, Embase and the Cochrane Library. Citation and handsearching were also carried out. Studies were selected if the majority of participants were under two years old with bronchiolitis as their main condition and high-flow nasal cannula therapy was used. Articles were excluded if there was no data from an ED or equivalent setting and if they primarily included life-threatening or severe conditions. Ten articles were used in the review. Common themes were identified from the literature. Primary outcomes that emerged included the physiological impact of commencing high-flow nasal cannula therapy in the ED. Overall, the studies suggested that beginning the therapy improved children’s vital signs significantly more in the first hour of treatment compared with standard therapy and led to a reduced number of intubations. Further secondary outcome measures included the cost-effectiveness of beginning high-flow nasal cannula therapy in an ED, the safety of the therapy in an ED, tolerability and whether the therapy helps to identify future care needs. The studies suggest that early use of the therapy could help to ascertain whether a child needs to be in critical care. Findings on its cost-effectiveness varied. All the studies suggested it was a safe and tolerable method of delivering oxygen. Findings from the literature review along with guidelines and evidence have been considered in recommending how the results could be applied in practice. Looking at whether guidelines need to be changed. Criteria for beginning high-flow nasal cannula therapy. While the results of the ten studies are consistent, suggesting high-flow nasal cannula therapy is an effective method to use, there is a lack of good evidence, particularly in the form of multi-centre randomised controlled trials and studies based in England, which was part of the original objective of the dissertation. More primary studies should be conducted on a larger scale before the results of this review are applied in practice. Long E, Babl F, Duke T (2016) Is there a role for humidified heated high-flow nasal cannula therapy in paediatric emergency departments?